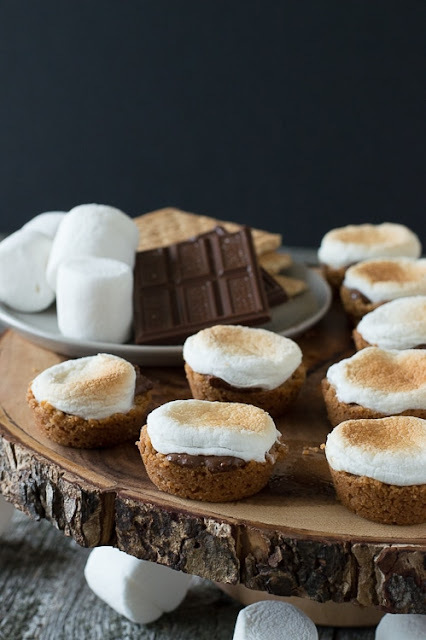 S’mores Bites – a twist on the classic dessert, make these little S’mores Bites in the oven! Making and enjoying s’mores is a summer classic. But what do you do if you don’t have access to a fire pit to make them the old fashion way? Well you get a bit creative- you can use the grill, the microwave, the stove, and dare I say a candle! Finely crush the graham crackers into crumbs, using whatever method you want. I used my slap chop, but a food processor would work or even putting them in a plastic bag and smashing. Combine graham cracker crumbs, powdered sugar and melted butter into a small bowl. Evenly divide crumb mixture into each cup of a 24 cup mini muffin pan, grease slightly before using. Press crumbs down to form shallow cups. Bake 4-5 minutes or until edges are golden. While that's baking, break the candy breaks into the divided rectangle pieces. Also cut the marshmallows in half using a scissors that has been sitting in cold water. Remove the pan from the oven and place one chocolate rectangle into each cup. Place one marshmallow half, cut-side down, into each cup. Return to oven for 2-4 minutes or until marshmallows are just slightly softened. If you'd like the tops to be brown, turn the oven to broil, and broil the s'mores bites for 1-2 minutes. Cool on a cooling rack for 15 minutes before carefully removing them from the pan. 0 Response to "S’mores Bites "